Posted by Unknown , 04:47 Be the first to comment! The King of Fighters 2003 game for PC is a team play in which you have to select three players of your choice and will have to win the match against three opponents. The story mode is the simple and most interesting play where fighting three opponent in three matches is most interesting play. 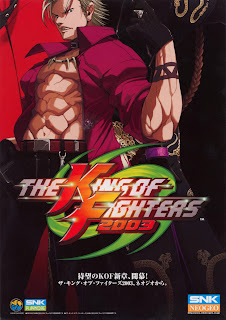 The King of Fighters 2003 game develpoed by SNK. You have the option to change the player durning the match. For example you are fighting with Robbet and want to change your character you can do it by simply pressing a button that mean you dont need to wait for change of match to change the players. Unlike the previouse version of KOF 2002 where there were 50 characters but in KOF 2003 there are only 30 characters. The graphics and sound are imporved and game is worth playing it great fighting game where you can play team versus team game.